Mr. Som Chanmony – Welcome to Peace Bridges! For me, peacebuilding has been a journey of faith. I find my motivation for peacebuilding in the teachings of Jesus – loving those who are different than you, forgiving those who hurt you, and practicing nonviolence. As a peace trainer, it is very important to me that I live out the principals of peacemaking in my own life. I believe that the work to transform violence is easier when it is grounded in what people believe. I have learned that all religions value peace, love, nonviolence, and human dignity. Therefore, a life of peacebuilding is not limited to the members of any religious group. We need to learn to separate faith and values and to appreciate the values of all religions. I love how peacebuilding involves crossing the boundaries of religion and class to build healthy relationships. In my own journey of peacebuilding, I have applied these ideals in my church, my work, and my family. I am excited to play a part in the growth of peace in Cambodia as Peace Bridges director. 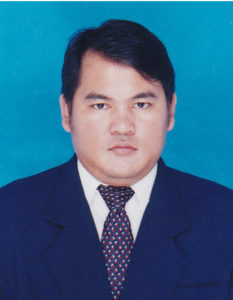 Mr. Som Chanmony came to Peace Bridges in 2003 as an Associate Administrator. Since then, he has worked as an Associate Training Coordinator, Training Coordinator, and General Service Manager. In August 2010, he became Peace Bridges’ Director. Chanmony is married with one son.